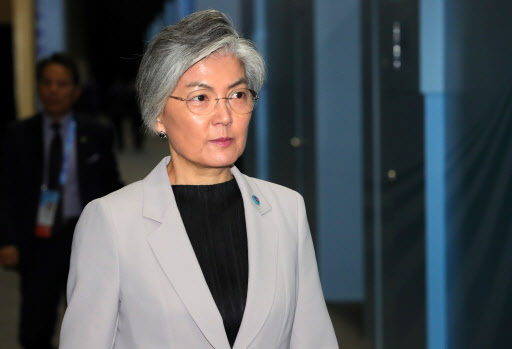 Foreign Minister Kang Kyung-wha held bilateral meetings with her counterparts from six Southeast Asian countries in Singapore on Tuesday to secure support for the government’s efforts to denuclearize the Korean Peninsula and to foster ties with the ASEAN bloc. Kang, who arrived in Singapore on Monday to attend a series of meetings on security in Asia, held bilateral meetings with foreign ministers of Malaysia, Myanmar, Vietnam, Cambodia, Brunei and Laos, promoted the government’s New Southern Policy aimed at expanding exchanges with the ASEAN countries, and called for their support. Kang also shared the latest developments in the government’s drive to achieve denuclearization of the Korean Peninsula as South Korea and the US engage in talks with North Korea to lead it to give up its nuclear weapons program. During her meetings with the ministers, Kang explained that “denuclearization is a complex process and the South Korean government is making efforts in terms of inter-Korean relations and will play a role in advancing such talks between North Korea and the US,” said an official from the Foreign Ministry on condition of anonymity. The ongoing engagement with North Korea is not only about unilaterally denuclearizing the reclusive country, and discussions are underway on measures to guarantee the North Korean regime and establish a peace system as demanded by North Korea, Kang was quoted as saying by the official. A North Korean delegation, including Kim Chang-min, director-general at international organization bureau at North Korea’s Foreign Ministry, arrived in Singapore on Tuesday morning. North Korea’s Foreign Minister Ri Yong-ho is believed to be arriving in Singapore on Friday. Among the many multilateral forums held in Singapore this week, North Korea is expected to attend only the ARF scheduled for Saturday. South Korea allegedly requested a meeting between foreign ministers of the two Koreas on the margins of the ARF, but it has yet to receive a response from North Korea. US Secretary of State Mike Pompeo is also to arrive in Singapore on Friday for a two-day trip. Pompeo is expected to hold talks with Kang on Saturday. It is unclear whether he will hold a meeting with his North Korean counterpart. The US State Department did not rule out a one-on-one meeting between Pompeo and Ri amid a lack of progress on follow-up to the June 12 summit between US President Donald Trump and North Korean leader Kim Jong-un. During the summit, the leaders committed to complete denuclearization of the Korean Peninsula in return for a security guarantee by the US. But they fell short of agreeing on details such as when and how to achieve the goal. The annual meeting of the foreign ministers of Southeast Asian countries and their partners comes amid reports that Pyongyang is continuing to build intercontinental ballistic missiles, which intensified doubts over whether North Korea really intends to abandon its nuclear program. At the ARF, Pompeo is expected to urge tougher enforcement of UN sanctions on North Korea aimed at dismantling Pyongyang’s nuclear weapons program. One of the highlights will be a multilateral meeting scheduled for Saturday among foreign ministers from 27 countries, including South Korea, North Korea, the US, China, Japan and Russia. Kang is also to take part in four other ASEAN-related sessions: an ASEAN-South Korea foreign ministers’ meeting and a Mekong-South Korea foreign ministers’ meeting Friday, and ASEAN Plus Three and East Asia Summit on Saturday.